As we speak, countries are debating a treaty that could make multilateral nuclear disarmament a reality. Why are we silent? Pic: Molly Scott Cato, second from left. “The hardest thing was getting over the fence – I’m not as nimble as I used to be,” jokes Molly Scott Cato, after the Green MEP was arrested (and released) in Belgium on Wednesday. The South West MEP had broken through the fence of a nuclear weapons site – with her and three other MEPs laying on the runway for about half an hour next to F-16 fighters. But why did the MEPs do it? As we speak, countries around the world are debating and ratifying a treaty that aims to put into practice a policy that nearly all politicians say they support: multilateral nuclear disarmament. The Treaty on the Prohibition of Nuclear Weapons was launched at the United Nations headquarters in New York on 20 September 2017 – and once 50 nations have ratified or acceded to it, it will enter into force. There are now 70 signatories and 21 states that have fully ratified the treaty. Indeed, both the Tories and Labour say they’re committed to multilateral nuclear disarmament. But they don’t follow through. The European Parliament backed a resolution in favour of the ICAN process in October 2016. But member states are not moving fast enough to implement it, says Scott Cato. On Wednesday she and three other MEPs were arrested after breaking into a Belgian military airbase to protest against the stockpiling of American B61 nuclear bombs. 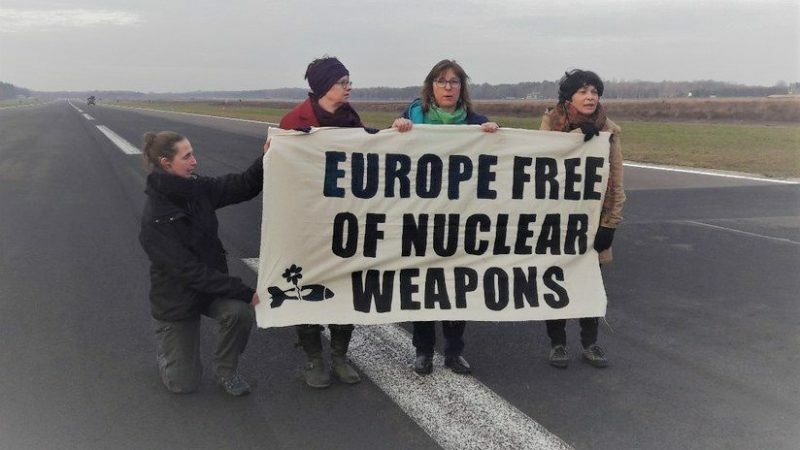 The politicians were holding banners calling for a “Nuclear free zone for Europe” and blocked the runway of an F-16 airbase to request the withdrawal of ‘US nuclear bombs on European soil’. The move follows Donald Trump’s decision to withdraw from a key arms agreement with Russia – one which dates back to Gorbachev and HW Bush. Trump has accused putin of breaking the rules of the deal.